Starring David Oyelowo, Rosamund Pike, Jack Davenport, Tom Felton, Laura Carmichael, Terry Pheto, Jessica Oyelowo, Arnold Oceng, Anton Lesser, Anastasia Hille, Jack Lowden, Nicholas Lyndhurst, Vusi Kunene, Theo Landey, Abena Ayivor, Charlotte Hope and Donald Molosi. Distributed by Fox Searchlight Pictures. 111 minutes. Rated PG-13. Politics and love sadly all too often make strange bedfellows. Arguments can be made as to whether A United Kingdom is a romance with a political slant or a political story with a romantic backdrop. 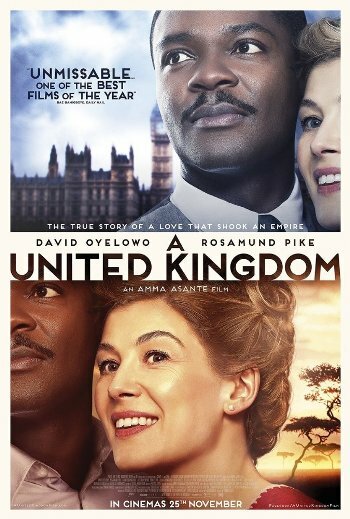 In recent interviews I did with the two stars and the film’s director, I found that the two actors (David Oyelowo and Rosamund Pike) look at A United Kingdom as a love story, while director Amma Asante (Belle) considered the politics to be the driving force. All three of them are probably right, in differing ways. The story of Seretse Khama and Ruth Williams was certainly an eye-opener back in 1947, when it occurred. He was a black man who was in line to become the King of the African kingdom of Bechuanaland. She was a middle-class white British clerk. They met when Ruth was dragged to a party by her sister. Seretse Khama and Ruth Williams bonded over jazz and politics and civil rights. They found themselves falling in love at first sight. Seretse asked Ruth to marry him and come home with him after just a few dates. She agreed. Both were surprised by the massive blowback this caused. Ruth was basically disavowed by her family, and his family and his people also were very resistant to the relationship. More importantly, it became a political football, with the government of England and more stealthily South Africa using them as political pawns to take over their country. It was only through taking a huge political risk of changing the kingdom to the democracy of Botswana that they were able to save the country from annexation. It is a dramatic and mostly forgotten historical drama which is eye opening and disproves many strongly held beliefs – British Prime Minister Winston Churchill in particular comes off looking very bad here. As far as being a love story, A United Kingdom is a sweet, if slightly overwrought and old-fashioned, tale of devotion. Luckily Oyelewo and Pike bring the characters a sense of majesty and connection, two great pros who know how to spark a scene even when things occasionally slow down a tad too much. A United Kingdom is sadly all too trenchant a story today, perhaps even more trenchant than it was when the film was originally planned. Both in terms of love and politics, it is very much a story that is needed in this very uncertain time in history. Copyright ©2017 PopEntertainment.com. All rights reserved. Posted: February 16, 2017. Tags: A United Kingdom, Abena Ayivor, Anastasia Hille, Anton Lesser, Arnold Oceng, Bechuanaland, Belle, Botswana, Charlotte Hope, David Oyelowo, Donald Molosi, England, Jack Davenport, Jack Lowden, Jay S. Jacobs, Jessica Oyelowo, Laura Carmichael, Love, Nicholas Lyndhurst, politics, PopEntertainment.com, rosamund pike, Ruth Williams, Seretse Khama, south africa, Terry Pheto, Theo Landey, Tom Felton, Vusi Kunene, Winston Churchill. Bookmark the permalink.